Rogue One’s Captain Andor Series coming to Disney Streaming Service! Thread: Rogue One’s Captain Andor Series coming to Disney Streaming Service! Gee, haven't been that curious about a Star Wars project since, well, can't even remember when. Edit : fingered cross lol, gotta be one of the craziest thing i have ever wrote. Last edited by Starter Set; 11-11-2018 at 01:03 AM. People were clamoring for this? No^,yet i'm surprised and glad they are making it. Cassian Andor: Some of us, most of us, we've done terrible things on behalf of the Rebellion. We're spies. Saboteurs. Assassins. Everything I did. I did for the Rebellion. And every time I walked away from something I wanted to forget I told myself it was for a cause that I believed in. A cause that was worth it. Without that, without a cause, we're lost. Everything we've done would have been for nothing. I couldn't face myself if I gave up now. None of us could. 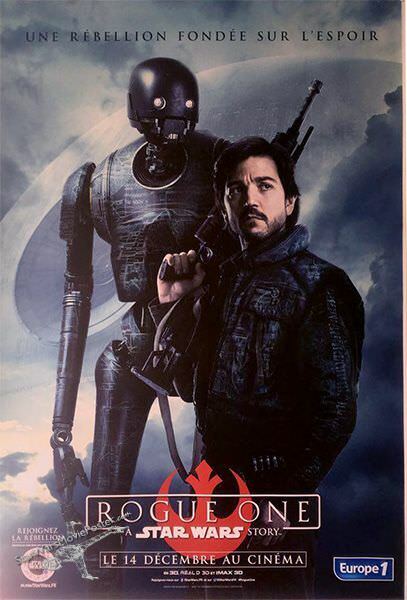 Cassian Andor was a unique look at a darker side of a Rebel fighter/spy, who'd been doing it so long, following orders, killing, he'd lost his humanity (and tragically knew it), to the point where there was no turning back after all he'd done, all that was left for him (and his team), was to die completing his mission. Interesting to see how he got there. Also K2-SO: Ironically the cold gunmetal Imperial Assassin droid, Cassian who had lost his own humanity, reprogrammed him to be more human than himself. Like he was afraid of losing that, so made the assassin droid, human, while he became the cold killer. What's great about also re-introducing K2-SO and how they became a duo, is there is a hint K2's programming actually survived them all, so he would have memories of all this. Also Cassian was the one who first said "Rebellions are built on Hope". R1 was a great ensemble team, and character arcs, they weren't the ones who get the medals, the kiss from the princess, the recognition, glory, or any reward. Buried within a bigger war/heist epic, with a simple mission (we don't mater, and never will, all that maters is get the plans (and hope) into the right hands). All culled from one line in the classic crawl about Rebel Spies. Plus of all of the Rogues, he really was "the Rebel Spy" of the opening crawl. They should actually just call this series Star Wars: "Rebel Spy"
Last edited by Güicho; 11-09-2018 at 08:30 PM. I can see the series also delving into the Clone Wars as well. As he said in the movie, Casian's been "fighting this war since I was six years old" and the extra-movie stuff reveals that's because he was part of the Seperatists (Which were sort of a "proto-rebellion" although one that was founded under false motives and with villains such as the Trade Federation involved). No, but I'll take it if there's a DVD release. I wonder if Disney regrets killing all those characters. R1 was a major success for them. Beside them, well, we will have more Andor (and most likely K2 with him, why Disney would pass on him?) and do we really need to know more about Jyn's story? It's fine the way it is i think. God, I am so tired of Star Wars' obsession with prequels. Why does every single thing besides main episode movies needs to be a prequel? LITERALLY EVERY SINGLE THING! You are making a prequel of a prequel! Goddammit. Stop with prequels (unless we're talking hundreds to thousands of years old Old Republic stuff), stop with OT-era stuff. Its over. Its been told and explored in great detail. Move on. I thought Disney would apply this with more gusto since acquiring the rights and starting the sequel trilogy. But they've fallen into the bad habits of Lucasfilm beforehand. More K2-SO isn't a bad idea, although the problem with any prequel is the limits put onto the story by established canon. God, I am so tired of Star Wars' obsession with prequels. Yeah, I don't know what it is with Star Wars and prequels. They always introduce characters, quickly (and usually, unceremoniously) kill them off, and then want to pump out shows, comics and novels about them. I'll never understand it. Last edited by Xero Kaiser; 11-11-2018 at 12:49 PM. Prequels have, in some way, been around in some form in extended Star Wars fiction-Including the two subjects used for the spin-offs. Brian Daley wrote younger Han Solo novels in the late 70's and early 80s (a second series, which filled in gaps and focused more on Han's even younger days, was published in the 90's by AC Crispin). The ANH radio drama also had a lot of extra story involving the theft of the death star plans (Which later kind of became much more complicated when other writers offered up their own takes.....if anything, "Rogue One" helped clean up a bit of a mess). There's been some hints at Disney's version of the Old Republic, but that's mainly been in the 'toons and comics. The current Vader comics arc involves Vader getting the ideas for his Mustafar castle from the spirit of an ancient Sith lord. Aspects of the Mandalorian and Jedi/Sith conflicts are also still in canon, although it's unclear if stuff like Revan etc.... are. Bane of course still is but his Clone Wars design seems to evoke an ancient Vader more than the bald guy with organic armor from the previous EU. Maybe. There was apparently a draft where Jyn and Cassian survived. The filmmakers had it on hand in case Disney asked them have survivors, but the Powers That Be okayed an everyone dies ending without a fuss. Because it's opens the doors for new stories and won't tread on the toes of future filmmakers? Even after all the EU i read i think there could be unique takes but i don't trust Disney.